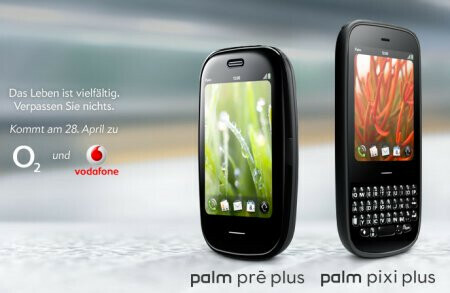 Germany is going to get even more love from Palm as they've officially confirmed that both the Palm Pre Plus and Pixi Plus are heading into the country – both being tied to an April 28th official launch. As a whole, Palm's devices are being spread out to other wireless providers littered across Europe as they've confirmed that both O2 and Vodafone are expected to see the light of the devices – it's also being reported that UK owners can expect to see them available through O2 UK as well. The somewhat blitzkrieg maneuver will hopefully spur the much needed sales of the two handsets on a worldwide scale. For their part in doing what they can, O2 Germany has been a prominent figure in attempting to make the Palm Pre a success – unfortunately, they will no longer have the exclusivity as they did previously. It's not to say that's a bad thing, especially for Palm, but this all out tactic might signal Palm's determination to make things work – or a last ditch effort to change their fortunes around.